Saganaki is a popular Greek cheese appetizer that is set on fire table side. A lot of people complain that this dish is too salty, but this website provides excellent information on the different types of cheese (with varying levels of saltiness) that you could use for this dish. I tried the kefalograviera and the graviera cheese and I much preferred the graviera. This site also provides great step by step photo instructions. If you don’t have a saganaki (the name of the pan that is used), you could use a small cast iron pan like I did. 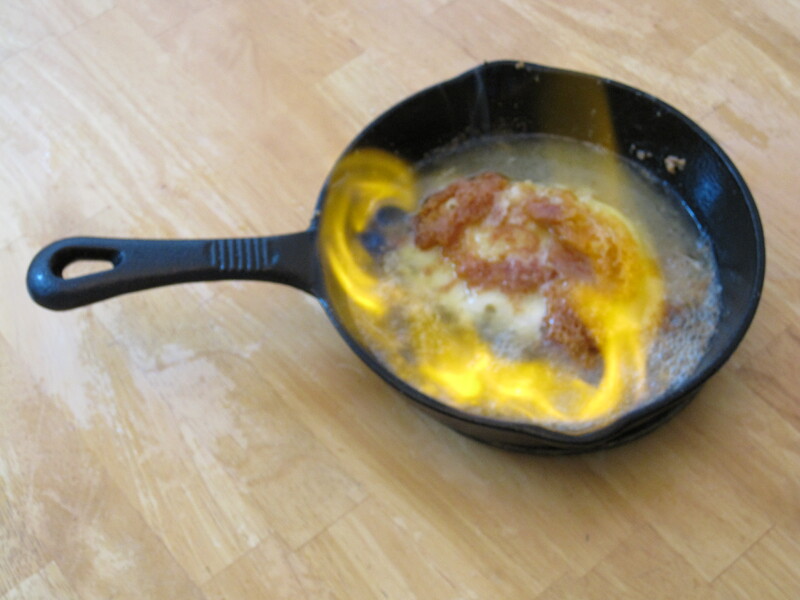 Please don’t judge the recipe by how my saganaki turned out. 🙂 My pan wasn’t hot enough or seasoned enough when I put the cheese down, so it stuck to the bottom of the pan. It didn’t look great but the outside was deliciously crispy. Pour approximately 1/8 cup of all purpose flour into a shallow dish and set aside. Preheat your saganaki pan or cast iron pan over medium high heat. Meanwhile, rinse your cold piece of cheese under cool running tap water, gently shake off the excess, and dredge it in the flour. Press gently to ensure that the flour sticks to all sides of the cheese. When your pan is hot, lightly coat the bottom of it with the oil. When the oil is hot (ie. sizzles when you sprinkle in a bit of flour or water), then place one of the largest sides of the cheese down into the pan. Allow it to sear for about 2 minutes and then flip it over. Allow it to sear for another 2 minutes. Once both sides of the cheese have browned nicely, carefully carry it to the table and pour over the ouzo. Then, very carefully, light it on fire with a long, lit match. Allow the alcohol to burn for a couple of seconds and then squeeze the lemon over the pan to put out the remaining fire. Enjoy it hot with bread.